The International Atomic Energy Agency (IAEA) offers an Operational Safety Review Team (OSART) program where international teams of experts conduct in-depth reviews of nuclear power plant operational safety performance. Performance is reviewed in various areas such as management, training, operations, maintenance, etc. The reports also include comments about plant safety culture (SC). 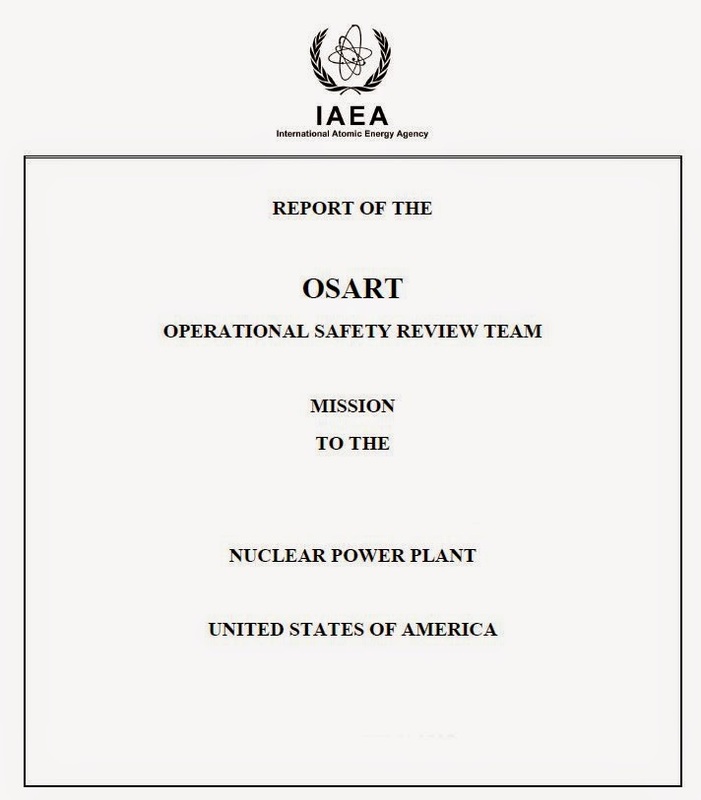 IAEA has conducted scores of OSART reviews, including U.S. power plants. This post covers SC-related findings for the U.S. plants; we are interested in what kinds of SC strengths and weaknesses the teams identify during their approximately two-week visits. There is an interesting discrepancy between the two versions. The first report says “The emphasis the plant is making on self-assessment and improving human performance to bring about a sustaining safety culture is presently balancing the perception of increased cost drivers and short term budgeting.” (p. 13) This hints at a cost vs. safety goal conflict, a serious challenge to maintaining a strong SC. However, the second report does not include that statement, instead noting elsewhere that “In the teams opinion, however, there is presently little resource margin to absorb increased demands and although the highly motivated staff continue to look for ways to improve, the potential for complacency and demotivation from the prospect of long term challenges with aging facilities and equipment and tightening budget poses a risk to maintaining that performance.” (p. 9) Is this just a more politic way of saying the same thing or does it reflect an actual watering down of the report? The team’s in-depth review of the corrective action program (CAP) provides a look at the SC in practice. “The corrective action programme is very strong and closely monitored.” (p. 97) Aging mechanisms, especially corrosion, are a challenge for the corrective action program (p. 69) but the plant’s response led to this issue being closed during the follow-up visit. Rework is analyzed by a committee to address effective corrective actions (p. 57) but maintenance backlogs require constant attention. (p. 59) After the team’s initial visit the plant developed a new system for classifying condition reports; at follow-up the team observed “Based on the new graded system, the plant is improving opportunities to focus analyses and resources in accordance with the significance of the events.” (p. 100) Overall, this seems reflective of a SC that supports both the CAP and efforts to improve it. Another finding reflecting SC was that the plant Management Succession Planning and Development Program did not include safety performance in talent assessment, ranking or as a specified core skill. Brunswick claimed these factors were implicitly considered but strengthened the program to explicitly include nuclear safety, radiation safety and industrial safety goals for each plant staff member. The review team found this action sufficient to close the issue. (pp. 21-22) This is also indicative of a culture that encourages improvement efforts. The positive SC attributes in this report**** include a strong Human Performance program with a focus on continuous improvement, a rigorous and conservative approach when planning and performing tasks, and a willingness of staff to correct each other’s behavior without waiting to be corrected by management. In addition, conservative decision making is a core value within the management team. Problem areas include long standing defects throughout the plant (and first attempts to fix problems that do not always work), policies such as overtime and time pressure on outage schedule that suggest the plant is “cost” driven, and the benchmarking program does not work from a broad international base. (pp. 4-5, 34). Both an ineffective CAP and a cost-driven plant (i.e, goal conflict between cost and safety) reflect a weak SC. More significantly, plant problems include a lack of resolution of long term issues, plant material condition deterioration and degraded equipment conditions. (pp. 2, 44-45) Significant backlogs exist in the CAP, work orders and procedure change requests. (p. 8) Work backlogs are an indication of a culture that lives with issues rather than resolving them. Seabrook SC standards are summarized as “very positive” (p. 4) and maybe they are, but the reality of backlogs and unresolved long-term issues is inconsistent with a strong SC. It’s probably unrealistic to expect a group of foreigners to visit a U.S. plant for two weeks and come up with significant SC insights.^ The summaries of SC positives and negatives appear to be relatively superficial but findings in the functional areas can offer a look at the actual underlying SC. Some of the OSART observations and findings on key artifacts provide information from which we can infer the strength of SC at a plant being reviewed. Finally, compensation and reward systems appear to be outside the OSART scope but we know these are critical to reinforce safety-related behavior and overall SC. * J.D. Lee (NRC) to NRC Commissioners, “IAEA Report on OSART Mission at North Anna Power Station, January 22 to February 10, 2000” (Nov. 30, 2000). ADAMS ML010160525. ** IAEA, “Report of the OSART Mission to the USA North Anna Nuclear Power Plant 22 January to 10 February 2000” (Released Feb. 12, 2001). ADAMS ML010470115. *** IAEA, “Report of the OSART Mission to the Brunswick Nuclear Plant United States of America 9-25 May 2005 and Follow Up Visit 4-8 December 2006” no date. ADAMS ML071100006. **** IAEA, “Report of the OSART Mission to the Arkansas Nuclear One Nuclear Power Plant United States of America 15 June – 2 July 2008” no date. ADAMS ML083440148. ***** P. Freeman (Seabrook) to NRC, “IAEA Final Report OSART Mission to Seabrook Nuclear Power Plant USA 6-23 June 2011” (Mar. 16, 2012). ADAMS ML12081A105. ^ A partial view is suggested in the Foreword to the Seabrook report where the authors note that an OSART review represents a “snapshot in time.” In fairness, it would be equally unrealistic to expect a team of Americans to visit a foreign plant and develop a deep understanding of plant culture in a similar time period. 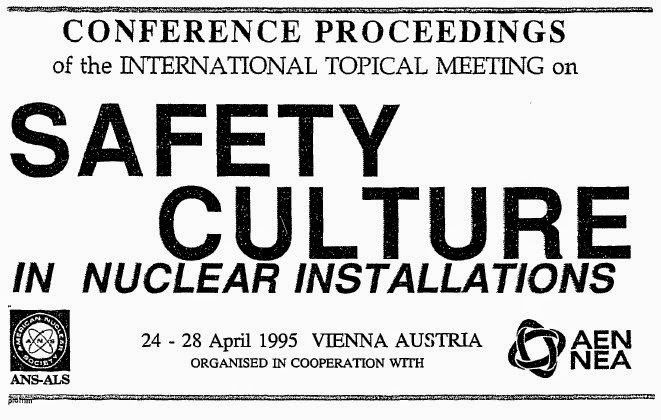 In April 1995 the American Nuclear Society (ANS) sponsored a nuclear safety culture (SC) conference in Vienna. This was a large undertaking, with over 80 presentations; the proceedings are almost 900 pages in length. * Presenters included industry participants, regulators, academics and consultants. 1995 was early in the post-Soviet era and the new openness (and concerns about Soviet reactors) led to a large number of presenters from Russia, Ukraine and Eastern Europe. This post presents some conference highlights on topics we emphasize on Safetymatters. For us, decision making should be systemic, i.e., consider all relevant inputs and the myriad ways a decision can affect consequences. The same rigor should be applied to all kinds of decisions—finance, design, operations, resource allocation, personnel, etc. Safety should always have the highest priority and decisions should accord safety its appropriate consideration. Some presenters echoed this view. In sum, nuclear thought leaders knew what good decision making should look like—but we still see cases that do not live up to that standard. Even in 1995 the presentations could have been stronger since INSAG-4** is so clear on the topic: “Importantly, at operating plants, systems of reward do not encourage high plant output levels if this prejudices safety. Incentives are therefore not based on production levels alone but are also related to safety performance.” (INSAG-4, p. 11) Today, our own research has shown that nuclear executives’ compensation often favors production. There are three system-related presentations that we suggest you read in their entirety; they have too many good points to summarize here. One is by Electricité de France (EdF) personnel (pp. 193-201), another by Constance Perin (pp. 330-336) and a third by John Carroll (pp. 338-345). Here’s a sample, from Perin: “Through self-analysis, nuclear organizations can understand how they currently respond socially, culturally, and technically to such system characteristics of complexity, density, obscured signals, and delayed feedback in order to assure their capacities for anticipating, preventing, and recovering from threats to safety.” (p. 330) It could have been written yesterday. By 1995 INSAG-4 had been published and generally accepted by the nuclear community but countries were still trying to define the appropriate role for the regulator; the topic merited a half-dozen presentations. Key points included the regulator (1) requiring that an effective SC be established, (2) establishing safety as a top-level goal and (3) performing some assessment of a licensee’ safety management system (either directly or part of ordinary inspection duties). There was some uncertainty about how to proceed with compliance focus vs. qualitative assessment. Today, at least two European countries are looking at detailed SC assessment, in effect, regulating SC. In the U.S., the NRC issued a SC policy statement and performs back-door, de facto SC regulation through the “bring me another rock” approach. So conditions have changed in regulatory space, arguably for the better when the regulator limits its focus to truly safety-significant activities. But some things have changed. For example, several presentations mentioned SC surveys—their design, administration, analysis and implications. We now (correctly) understand that SC surveys are a snapshot of safety climate and only one input into a competent SC assessment. And some things did not turn out well. For example, a TEPCO presentation said “the decision making process is governed by the philosophy of valuing harmony highly so that a conclusion preferred by all the members is chosen as far as possible when there are divided opinions.” (p. 583) Apparently harmony was so valued that no one complained that Fukushima site protection was clearly inadequate and essential emergency equipment was exposed to grave hazards. * A. Carnino and G. Weimann, ed., “Proceedings of the International Topical Meeting on Safety Culture in Nuclear Installations,” April 24-28, 1995 (Vienna: ANS Austria Local Section, 1995). Thanks to Bill Mullins for unearthing this document. ** International Nuclear Safety Advisory Group, “Safety Culture,” Safety Series No. 75-INSAG-4, (Vienna: IAEA, 1991). INSAG-4 included a definition of SC, a description of SC components, and illustrative evidence that the components exist in a specific organization.